Looking for a watch that makes classy cute? The Miss Pasha WJ124021 by Cartier finds that perfect combination in a timepiece to add fearless fun to your already fine fashion. 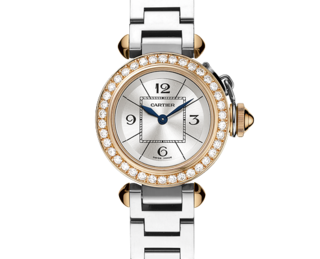 This timeless pink gold and stainless steel ladies’ watch is among the many favorites in Cartier’s long line of quality watches. The Miss Pasha blends gold and steel into a classic timepiece with a design that is both elegant and playful. The bezel is 18k pink gold and circled all around with round cut diamonds. The crown is also covered with 18k pink gold and the silvered dial is touched with a sunray finish. Arabic numerals mark the 12, 3, 6 and 9 o’clock positions of the watch face and are passed by the staidly ticking sword-shaped blue-steel hands. The square outline at the center of the face is complemented by the lines marking the rest of the numbers, which creates a sundial-like appearance when combined with the minute markers around the rim. This precise blend of timeless and modern is part of what makes this watch unique and fun. Set in motion by the high Cartier caliber quartz movement, the Miss Pasha is water resistant to 100 feet and coated with scratch resistant sapphire crystal, all features perfect for the most adventuresome woman’s needs or simply to protect against everyday occurrences. The stainless steel bracelet fits smoothly on your wrist, and knobs of gold near the watch face set off the silvery finish. Secured by a hidden folding clasp, this watch won’t be easily lost and will carry you through your time-related needs in high fashion. 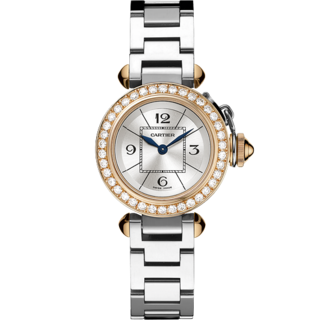 For $12,900, this classy ladies’ watch can be your very own, and while this is no small price to pay, with such an elegant combinations of diamonds and gold it would be hard to find a finer watch in quality or appearance. Personalize your creation by choosing a complimentary engraving by Cartier, to make your gift special with a message, or to give yourself a bit of inspiration whenever you need the time. Or you can ensure your wrist is perfectly fit by asking for a complementary bracelet adjustment. 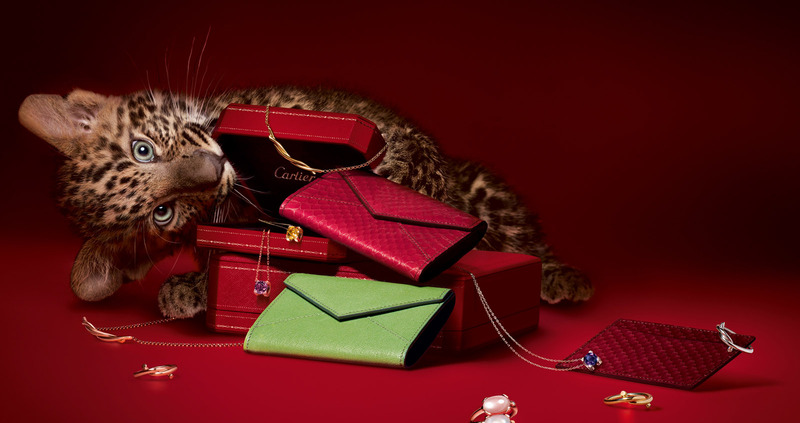 Whatever your request, Cartier will deliver with their constant quality of style and include their exclusive red Cartier gift box as well. Be a playful kind of classy with this new favorite timepiece, let the Miss Pasha WJ124021 show you how in a way only Cartier knows.